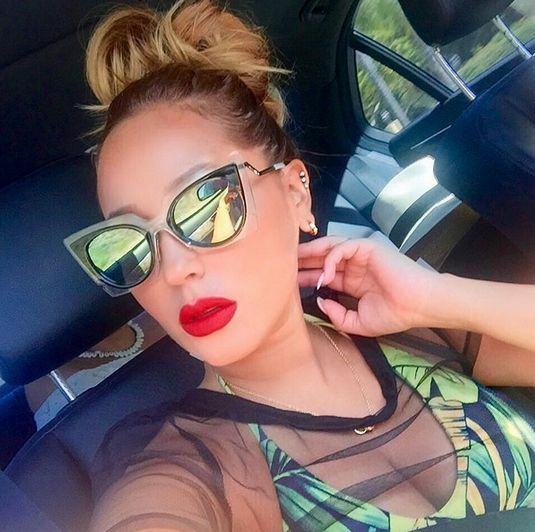 Home / Adrienne Bailon / Andrea Iyamah / Bikini wear / Celebs Gossip / Features / Fendi mirrored shades / Tropical Print Bikini / CO-HOST OF THE REAL TALKSHOW ADRIENNE BAILON TAKES MALIBU IN A TROPICAL PRINT BIKINI BY NIGERIAN DESIGNER! CO-HOST OF THE REAL TALKSHOW ADRIENNE BAILON TAKES MALIBU IN A TROPICAL PRINT BIKINI BY NIGERIAN DESIGNER! Look who’s looking hot in the hot Malibu sun in Nigerian fashion?! It’s actress, singer & Co-Host of The Real Daytime Talkshow – Adrienne Bailon. On a recent trip to Malibu, she rocked a piece from Nigerian fashion label, Andrea Iyamah‘s 2014 collection. The bikini features tropical prints, which she paired with a sheer top, gold accessories, statement Fendi mirrored shades and a bold red lip. Adrienne hung out with friends at the beach front while looking hot in the 2-piece.